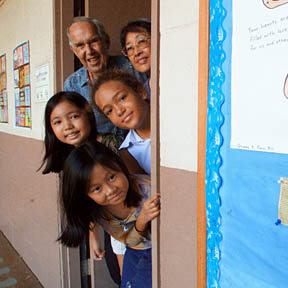 Seniors Krentzman and Lum, volunteers of FELLOWS, a program that paves the way for Oahu's oldest and youngest residents to mutually benefit one another, join the group in the doorway of the senior center on the school's campus. Starbulletin.com publishes online editions Monday through Sunday. New editions normally posted online between 2:00 and 5:00 a.m. Starbulletin.com publishes articles written by our staff and selected articles of particular interest to our readers. Entire contents of this Web site © copyright 2004 Honolulu Star-Bulletin. All rights reserved.